This template allows you to create your own customised website terms and conditions of sale easily. These T&C are for online retailers that sell products that have been created, customised or sourced specifically to order. Not all of your products have to be such - the majority could be 'standard' products that are sold without alteration. present a professional image of your business. Our use of plain language helps ensure customers do not feel intimidated by overly formal or legalistic language. Your customers could be located in any country. These terms and conditions include provisions for sale abroad as well as within the Republic of South Africa. physical goods (rather than downloaded products such as software). 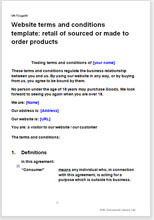 Website terms and conditions template: retailer of goods part designed by site visitors is suitable for a business that sells products that have been designed by site visitors. For example, site visitors may contribute their own artwork to be printed on products (such as clothing). This template complies with Electronic Communications and Transactions Act 2002, the Consumer Protection Act 2008, and other latest consumer protection legislation allowing you to sell to businesses or consumers. Where statute law could apply, the T&C have been drawn then applies to specific circumstances, for example, we have included provisions to comply with the, but these are only relevant if the type of goods sold is electronic or electrical.